Thank you for signing up to our email! Now, before you leave, do you want to make a seal's day? February 20, 2013 - update! Read an update about former entangled elephant seal patient Green Tie here! This elephant seal was rescued by U.C. Santa Cruz researchers and The Marine Mammal Center on Dec. 19, 2011 with an extreme entanglement around his neck. A happy ending to one of the most extreme entanglement cases we've seen in recent years! On December 19, U.C. Santa Cruz researchers discovered this young Northern elephant seal at Ano Nuevo in Pescadero, CA, tightly entangled in monofilament line around his neck and part of his head. It appears that he's had this entanglement for a while, growing into and around the unyielding plastic trash which was slowly cutting into his neck. The Marine Mammal Center's Dr. Vanessa Fravel and Dr. Michelle Barbieri (see "Green Tie" story below) went out to provide medical assistance for the animal while U.C. Santa Cruz researchers carefully cut away the entanglement. Once the line was removed, Dr. Fravel and Dr. Barbieri washed the wound and gave him a quick exam to see if further medical care was needed. Turns out that as extreme as that entanglement looked, no vital areas were destroyed and the seal was in good body condition and weight. Shortly after he was freed, the seal made his way back to the ocean. So far this year, The Marine Mammal Center has rescued and treated 13 seals and sea lions with ocean trash entanglements. Call The Marine Mammal Center with as much information as you have regarding entangled marine mammals! Our Response lines are available 24 hours a day, seven days a week. Help us help marine mammals at our hospital! Rare Beach Disentanglement of an Elephant Seal! Update: November 18, 2011 - Green Tie Spotted Thriving on a Beach! Green Tie is spotted resting with other elephant seals on November 17 days after The Marine Mammal Center freed him of his entanglement. Days after he was freed from his entanglement - Green Tie was spotted on a beach near San Simeon snoozin' with other elephant seals! Here, you can still see the wound around his neck caused by the green packing strap entanglement. We wish Green Tie a long and healthy life in the wild! Dr. Michelle Barbieri holds the plastic strap she removed from Green Tie. Every year, countless numbers of marine mammals find themselves entangled in ocean trash, all thanks to human negligence. On November 10, a large 700 lb. elephant seal was spotted at Piedras Blancas near San Simeon with a green packing strap wrapped tightly around his neck. Many entangled animals are initially strong enough to escape rescue attempts and because they continue to grow, their entanglements become even tighter. In many cases, these animals die as a result of the entanglement restricting their ability to swallow or hunt effectively. As you can imagine, it can be a very slow and painful death. Fortunately for "Green Tie," as he was nicknamed, his rescuers from The Marine Mammal Center were able to help him before it was too late! Green Tie the elephant seal rests on a beach with an entanglement around his neck. Rescuers secure Green Tie in order to remove the packing strap entanglement around his neck. "State Park rangers notified us on 11/8 that this big male elephant seal was on the beach and had a nasty entanglement. We knew low tide would be our best chance of getting him before he made a break for the water, and that low tide was to occur in the late afternoon on 11/10. A volunteer went back to the location on the 10th to see if the animal was still there. He was, so veterinary intern Dr. Michelle Barbieri headed down from Sausalito to meet us and make a plan of exactly how we would approach this big animal and safely capture and restrain him. We estimated him to be just over 700 lb. – the biggest animal we’ve responded to so far his year! " Dr. Michelle Barbieri cleans the elephant seal's wounds. It was quite the challenge to get the rescue net over this animal! After he was in it, he managed to escape through an opening and almost made his way back to the water. Fortunately, we were able to get to him before that happened and get him back into the net. Once secured, Dr. Barbieri sedated him, and in a few minutes was able to cut away the entanglement. She then thoroughly cleaned the wound and saw that new skin was already growing over the wound - a good sign of recovery! We put a flipper tag on him (on the left rear flipper since he was a male,) took a blood sample, and named him "Green Tie" after the green plastic packaging strap he had been entangled in. About 20 minutes or so after he was sedated, Green Tie woke up and went back into the water, lounging in the shallows nearby. He will be sporting a scar around his neck for his lifetime, but at least he now has a second chance at life, entanglement-free!" With the packing strap removed and wound cleaned, Green Tie makes his way back to sea. The salty ocean water will help accelerate the healing process. Special thanks to volunteers involved in getting "Green Tie" free of his entanglement and back to the ocean! Gary Angelus, Jeff Sproul, Sarah Crass, Steve Johnson, Lisa Harper Henderson and Dr. Michelle Barbieri. As of this month, The Marine Mammal Center has rescued 494 marine mammals, including 89 elephant seals! 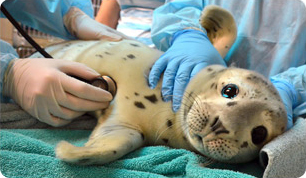 Adopt-a-Seal today and suport future patient care! We're Recommended by Outside Magazine! Find Out why Outside magazine voted The Marine Mammal Center one of the Top 30 orgs you should Donate to! Get patients stories, research news, gift ideas, event invites, offers and more delivered right to your inbox! Remember this noble animal with a symbolic adoption. Adopt-a-Seal® of the Month Club! Use your super powers and join monthly today!